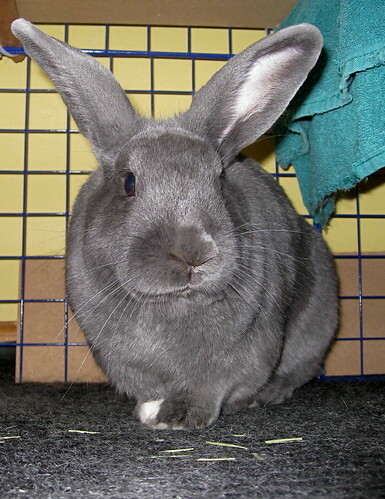 My best bunny friend Mr. Mitzy hopped his way across the rainbow bridge on Saturday, Aug. 7, 2010. A sudden illness took his life after only 1 year and 7 months. 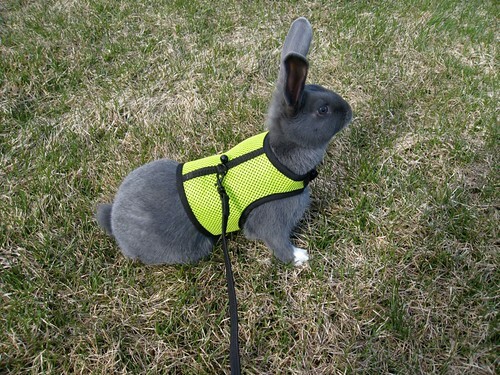 He was a wonderful Rex rabbit who kept me company while working from home. His ashes will be buried in an herb urn. 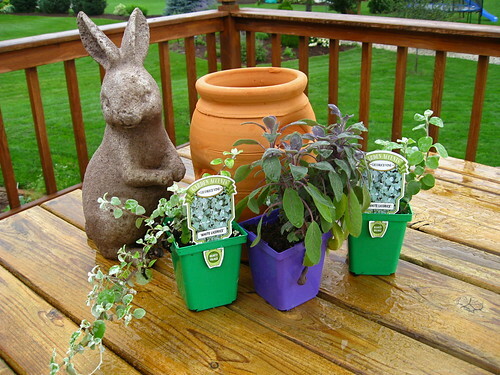 This year I'm planting it with a purple sage and some licorice vine that reminds me of his fur. Next year, I'll plant his favorite munchies. A stone bunny statue that resembles Mitzy as a baby will stand nearby. I adopted a 3-month-old Mitzy from the Bay Area Humane Society in March 2010. I thought I was getting a girly bunny but the vet said "It's a boy!" So the "Mr." was added to his name. The furry tumbleweeds got larger and larger as he grew up fast. He loved to play with all sorts of toys. His tunnel and rope carrot were favorites as a babe. He moved on to demolishing baskets. At 6 months old, he became king of his own castle. 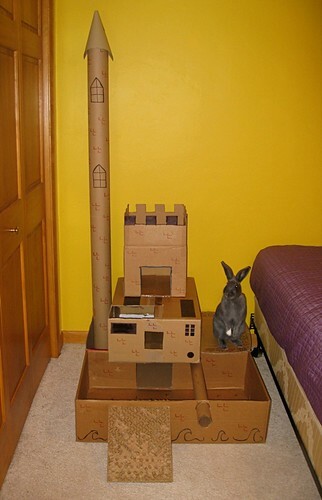 With that photo, he won a Cottontail Cottage in a Bunspace photo contest. A celebrity was born. When he wanted attention or more food, he rattled his cage. When I placed his litterbox in the "wrong" corner, he head-butted it to its proper location. And if I wanted to brush him, I had better be rubbing his nose, too. But those were small requests for what he gave back. When I was sad, he would let me hold him for snuggles. He would flop down next to me for rubbas after running his bunny marathon in the room. He would try new veggies, which is more than I can say of myself at times. 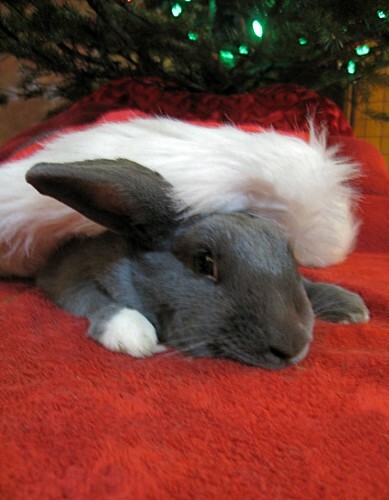 He even endured a Santa hat for the Christmas postcard. He grew to be 8 fluffy pounds. 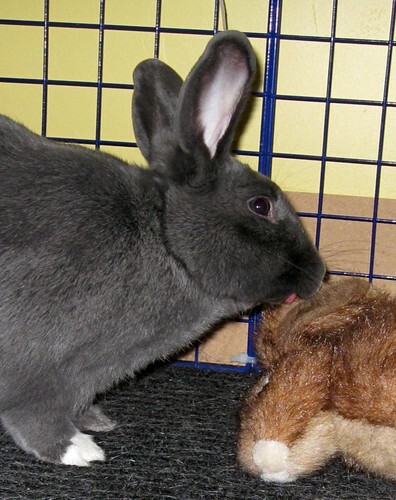 He shared his cage with his stuffed pal, Einstein, who he treated like a real rabbit. He was a good bunny to the end. I wish I could have saved him from whatever hurt him. He didn't deserve such a short life. He will always be my Mitzy and no bunny can replace him. 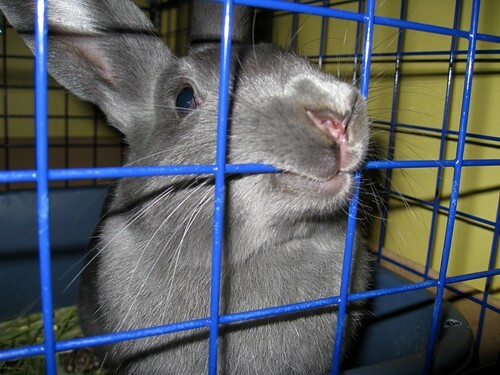 awwwwwww, what a wonderful post in memory of an adorable and obviously well loved bunny. I'm sorry about Mr. Mitzy Tanya honey. He was such a sweet heart a.k.a. kulta to see in your lovely blog posts about him. He reminded me so much of my old bunny Bennie my family used to own as a pet years ago. Tanya, were sorry to hear about that. Im sure hes happy in heaven. Were also sorry to hear about Gizzy aunt Carol, he was a great friend. Aw, thank you so much for sharing your pictures and that wonderful video of Mr Mitzy. He seems like a real sweetie. Hugs to you Tanya. I just wanted to say thank you for everyone's really kind comments. It feels good to know there are people who understand the strong bond between a person and a pet. Mitzy can never be replaced but I might look for a new bunny friend in a few months.